In early October last year, I received that dreaded phone call and my barn manager explained that Rocki (my accident-prone gelding) had a very swollen eye and was oozing all sorts of nasty things from his left eye. 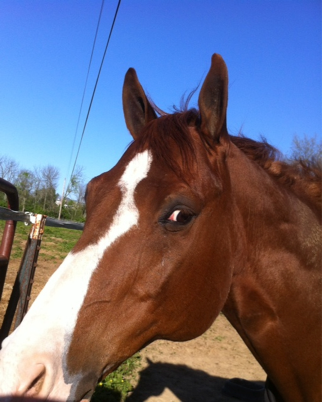 Funny, as the night before when I rode him, he was completely normal. My first thought was that he had something in it or hit it really hard over night in his stall, but after a visit from the veterinarian later that morning, it was determined that he actually had a rare fungus in his eye, Histoplasmosis. As my veterinarian described, it is most common that this fungus grows and presents itself as a tumor-like mass causing irritation once it becomes large enough, especially in something like the eye. This is rare in horses, in fact, this is the first time my veterinarian had ever seen this in the field (of course, my gelding would be the one to get it!). 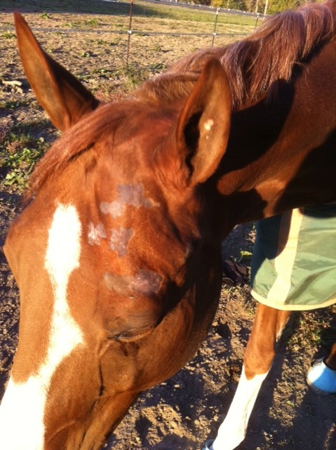 The reason for my gelding’s extreme swelling was most likely due to the fact that the mass simply became unbearable in the back part of the eye (you couldn’t even see the mass unless you pulled back his eyelids) that he rubbed on it so much overnight, it caused the swelling and watery eye. After six weeks of seeing my horse six times a day, the lavage was finally taken out. 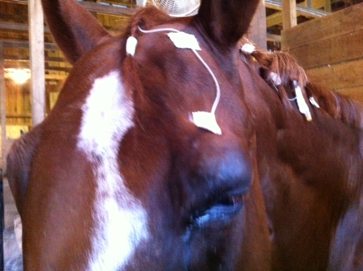 The only residual effect of the treatment was a little loss of hair due to the tape around his eye. Treatment was intensive and kept me on my toes for a full six weeks. The first step my veterinarian suggested was implementation of an eye lavage to administer the constant medications that my horse would have to receive (six times a day to be exact!) and a Panacur PowerPac. The eye lavage is typically implanted in the clinic, but the veterinarians that were working on my gelding decided to do it in the field. Rocki was a superstar through the whole process as they removed the mass in the back of the eye. I learned that having a scalpel that close to your horse’s eye is a little nerve-wracking. Then they installed the eye lavage, which I have to say was pretty neat to watch. I was then instructed on what to administer and when. To help maintain his digestive health, I also started him on SmartDigest Ultra right away because of all of the medications he was being given and his increased stall time. I even continue to keep him on this supplement today because of all of the digestive benefits.